Many Beijingers still remember the rows upon rows of bicycles for public rental that were left to rust on street corners following the 2008 Olympic Games. It had been hailed at the time of its launch before the games as an innovative scheme, although quickly proved to be unsustainable. Nevertheless, this experience hasn't deterred the Beijing government from revisiting the scheme, with new bikes for public rental hitting the street last week in a renewed bid to reduce carbon emissions in the smog-choked capital. The pilot bike rental program was launched in Beijing's Chaoyang and Dongcheng districts on June 14, with 2,000 bikes allocated at 63 outlets along subway Line 5 and Line 10. By showing an ID card or Beijing hukou (household registration) and paying a 200-yuan ($31.45) deposit, customers can rent and return bikes at any of these stations. The hourly rental fee is 1 yuan, or 10 yuan per day. If a bike is returned within an hour, there is no charge. The service will be available to all people after the trial period, local authorities said on Monday. Beijing is not the only Chinese city to offer bike rental, which is often the result of joint efforts from local governments and private companies. Currently 50 cities nationwide offer bike rental, according to the Institute for Transportation and Development Policy (China), an international NGO based in New York. The attraction of "going green" might be lucrative, but not all cities have benefited from the ambitious scheme. Experts question how the service can find success by being embraced by residents without losing investors' money, while debating what roles the government should play in popularizing the program. Rental bikes appeared in Beijing as early as 2005, with privately-owned bike rental businesses hoping to capitalize on the 2008 Olympic Games. To cater to the huge demand from tourists and visitors, bike rental businesses thrived in 2008 but struggled to survive after the Olympics due to minimal governmental support and plummeting demand. "We have lost 67 million yuan since 2005, with the Beijing government banning advertising on rental bikes and little preferential policies giving approval to construction of bike parking lots," said Bai Xiuying, manager of Bicycle Rental, one of the biggest bike rental providers in Beijing during the 2008 Olympics. Bicycle Rental charges a 400-yuan deposit for each bike, 5 yuan per hour and a flat rental fee of 20 yuan per day. The company used to boast 50,000 bikes at 200 outlets citywide, but currently there are only 400 bikes in service due to heavy financial losses. Other companies faced with similar problems, including difficulties returning bikes to different stations, either left Beijing seeing no future or went bankrupt. Beijing's new program with full government investment and operation by individual companies follows a similar business model in Hangzhou, Zhejiang Province - the most successful city in public bike rental. Hangzhou launched the service in 2008 with the city government authorizing a government-owned company under the city public transport group to manage and operate the business. The first bikes were located around tourist sites such as the West Lake, before spreading to commercial areas, residential compounds and suburbs. Now, rented bikes form part of the city's overall public transport plan. By September 2011, Hangzhou had more than 60,000 bikes for rental. Li Shanshan, public bicycle program manager with the transportation institute, said that Hangzhou learnt from foreign countries when launching its bike rental scheme. "Although rental revenue is minimal, the service in many foreign countries is still profitable from advertising or commission from cyclists with membership cards," Li said. Aside from Hangzhou, bike rental services in Shanghai, Zhuzhou in Hunan Province and Shenzhen in Guangdong Province have all proven to be effective to some extent, Li said. Shanghai's city government designated a private company to run the service and offered subsidies, while bikes in Shenzhen and Zhuzhou are of higher quality and more secure making them harder to steal, she explained. Even though some cities have succeeded with bike rental schemes, loopholes in management have still emerged, with bikes routinely broken or stolen. Many residents are discouraged when they find they cannot conveniently return a bike to an outlet other than the one they rented it from. Others are deterred by high deposits that need to be paid, or cumbersome procedures such as showing ID and filling out forms to register for membership. 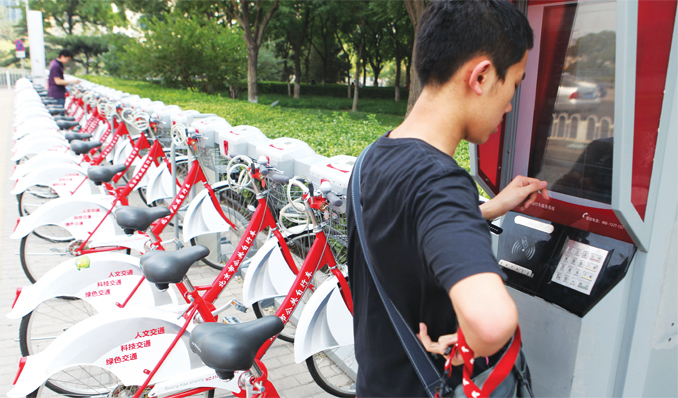 Beijing can learn from successful examples both at home and abroad, but it does not necessarily mean all good plans that worked in other places will suit Beijing, said Xiong Wei, a former employee with a Beijing-based NGO that studies China's public bike rental models. "Hangzhou is a city with a much smaller population than Beijing, and the city landscape is different," she said. "With an increasing number of cars, bike lanes have been taken over by vehicles and the air pollution makes people less willing to ride a bike." Beijing's city government has vowed to establish more bike rental outlets with a total of 50,000 bikes citywide by 2015. "The government should have a more scientifically planned map showing outlets, and provide maintenance of bikes, or else public utilities will be easily damaged, stolen or remain useless to residents," she added. Authorities should make thorough plans before adopting a bike rental system, said Ma Zhongchao, chairman of the China Bicycle Association. "Traffic congestion and cars occupying bus lanes have made the task tougher for first-tier cities like Beijing. It's not enough to adopt an intelligent bike rental scheme if efforts aren't made in other areas," Ma said.